Do you sometimes get frustrated with the tiny touchscreen keyboard on your Android smartphone? Does it sometimes insist on 'correcting' you as you type? In today's article, we'll explore some options to replace your phone's virtual keyboard. Read on! I have never liked the virtual keyboard that comes with Android. The buttons are too small, there’s no tactile feedback, and its auto-correct feature is hilariously inaccurate. My phone sometimes tries to replace my daughter Anna's name with "Bomb." Turns out I am not alone in my criticisms. Replacement keyboard apps are one of the biggest categories on Google Play. Let’s take a look at some of the most highly-rated keyboard apps. And if you've wished you could use a REAL full-size keyboard with your mobile device, I've got that covered too! The SwiftKey app averages 4.5 stars with more than 2.3 million ratings. Ironically, it’s made by Microsoft, which also has a version for iOS (iPhone) devices. SwiftKey has an impressive array of features that enable it to adapt to any user’s style. You can choose from three different keyboard layouts. If you like emojis, there’s an emoji keyboard. If you don’t like emojis, SwiftKey will ensure you never see one. Tapping can be replaced by swiping; that is, sliding your finger across the screen’s surface to the next letter you want, and then pausing on that letter. Swiftkey's artificial intelligence learns your writing style and uses this knowledge to better predict the next word you intend to type. AI also provides superior auto-correction, according to Microsoft. SwiftKey supports more than 80 background colors and themes, all of which are free just like the app. Of course, there's always the option to go Really Big. Connecting a real physical keyboard to your phone or tablet via Bluetooth is a great idea if your typing involves more than quick texts or emails. The Logitech Bluetooth Multi-Device Keyboard K480 works with computers, tablets and smartphones. It even includes a cradle for your mobile gadget, so you can see the screen easily while typing. Regular price is $49.99, but you can find it on Amazon for about half that price, in Black or White. The Cheetah Keyboard, formerly named Panda Keyboard, averages 4.6 stars with over 210,000 ratings. Like SwiftKey, it learns your writing style the longer you type with it. It also features swiping and cloud-based predictive autocomplete. More than 1,000 free themes are available, and there’s even a 3D keyboard. Cheetah taps a subset of animated GIFs from Giphy.com for occasions such as birthdays, anniversaries, etc. Cheetah is free and ad-supported. Gboard by Google, Inc. averages 4.2 stars. It has all the features of the native Android keyboard such as swipe typing and voice-to-text, plus key combos dedicated to finding emojis, GIFs, or anything else via Google Search. There’s a one-handed mode for very large-screened phones. Gboard learns your writing style and maintains a database of your frequently-used words in the cloud. This app is also free with ads. Bigger buttons are available in several Android keyboard apps. 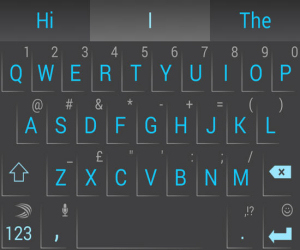 The 1C Big Keyboard has a novel layout that enables larger keys in a standard QWERTY layout; the app is free and ad-supported. Big Buttons Keyboard offers what it calls the Delta II modified-QWERTY keyboard layout. It looks strange at first, but the company says it’s easy to get used to and much faster than a QWERTY keyboard. Big Buttons Deluxe ($2.99) includes word prediction, themes, emoji, speech-to-text, arrow keys, adjustable button click intensity and volume, and more. There are no ads in the free or paid version of Big Buttons. Most recent comments on "Android Tip: Get a Better Virtual Keyboard"
The android RCA Viking or Galileo tablet with its removal keyboard has been a quiet secret. It is inexpensive at just over $100, powerfully capable, and simple to learn even for a Windows user. I like mine and figure it will rule the world when they figure out how to add a SIM card to it. I loved SwiftKey for Android but the IOS version is not as good. Wish it was. I tried at least 6 keyboards. Did my best to give them a week. Used on phone and tablet. My favorite is the Kii keyboard. Most customizable of any I tried. I have a picture my son drew as my background. But, the customization goes way beyond cosmetic. It has Swype. You can slide from a letter to space to get punctuation. Slide n to get /. Tons more. And the IOS version is not as good. Republic Anywhere is a suite of apps that lets you use your Republic phone number to send SMS (text) and MMS (picture/group) messages from any of your compatible devices, like your computer or tablet (coming soon!). Anywhere syncs your information across your devices so you always have your contacts and latest messages, regardless of what device you’re using. The first official release of Anywhere includes apps for macOS and Windows computers, plus an Android app for your Republic phone. iOS and Android tablet support is coming soon! Question: For the apps that are ad-supported, how and when do those ads show up? Does the ad cover the important part of my screen while I am typing? Or are the ads off to the side somewhere? Do I have to click the 'x' to close the image? (For example, the IMDB app on my Android phone shows annoying ads at the bottom of the screen and I have to waste a click to close it (which of course it then pops back up on whatever the next screen is). So, while I am generally only typing at the top (in search box) to find a movie or actor, the ad doesn't get in the way of typing. I might try the MS version as there is no mention of ads. What's with all the spamming in the comments? Let's stay on point, people. This article was about virtual keyboards, not removable keyboards or wireless companies. Btw, if Kii has ads, I haven't seen them. You can make shortcuts. BT could stand for Billtrue@gmail. It makes your own dictionary. The most customizable keyboard I found. I have always used "Swype" and I've loved it. However, lately I'm getting more and more bad autocorrects so I think maybe they enlarged their dictionary in a recent update. In my experience the smaller the dictionary in regard to autocorrect, the better. I don't need a lot of foreign words, place or people's names added. I just want "you" to be "you". I'm perfectly fine tap-typing the odd unusual word or name and IF I find I am using a word or name a lot, I'm ok adding it to the dictionary myself. I would prefer that to what I'm doing now, which is REMOVING uncommon words and names that are autocorrecting the common word I'm trying to Swype. And that works but it's effort I feel I shouldn't have to go through. How do they figure bigger dictionary's are better? Did you look at the long list of permissions that Kii wants? Definitely not for me. I am trying Big Buttons Deluxe and so far it looks good. The only thing that I don't like is that it doesn't try to predict the next word in the text that you are entering. I think it's worth noting that turning the phone to landscape orientation results in a bigger keyboard that could mean the big or clumsy finger frustration is lessened. I tried the Logitech K480 Bluetooth keyboard, and it had multiple problems connecting to my year- old Samsung S6. Once connected, it would randomly change the cursor position on the page while I was typing. I tried to get it to work for a week and finally returned it. I really want a good external keyboard, so I was quite disappointed. Has anyone had a good outcome with this or other models? There are reverse USB plugs you use with your phone, to enable a full size corded keyboard. I know that this is talking about a virtual keyboard, but due to my Parkinson’s Disease my hands especially my thumbs shake so bad that any of the “touch” keyboards are out of the question. Enter the Blackberry “Passport” it has a real keyboard that has a nice tactile feel to it and gone are all the mistakes. I use it as a tablet and it works fine for me. I never disagreed with Bob Rankin before, but there is a first time for everything.